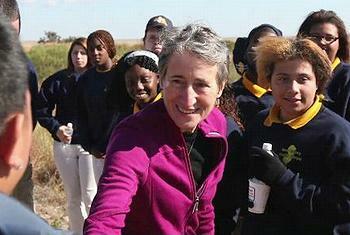 NEW YORK, New York, October 29, 2013 (ENS) – Today, on the one-year anniversary of Hurricane Sandy, U.S. Secretary of the Interior Sally Jewell launched a $100 million Hurricane Sandy Coastal Resiliency Competitive Grant Program. Up and down the Atlantic coast, local officials are taking stock of recovery efforts and resiliency upgrades to prepare for future storms. 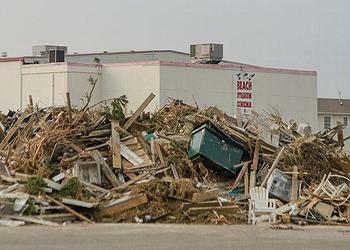 Sandy made landfall just north of Atlantic City, New Jersey, on the evening of October 29, 2012 after blasting across the Caribbean. In the United States, Sandy affected 24 states from Florida to Maine and west across the Appalachian Mountains to Michigan and Wisconsin, with particularly severe damage in New Jersey and New York. Its storm surge hit New York City on October 29, flooding streets, tunnels and subway lines and cutting power in and around the city. Estimates as of June 2013 assess damages at over $68 billion, a total surpassed only by Hurricane Katrina. At least 286 people were killed along the path of the storm in seven countries. In the United States, at least 117 people lost their lives. Secretary Jewell joined Members of Congress, local officials and the National Fish and Wildlife Foundation at the National Park Service’s Dyke Marsh Wildlife Preserve in Virginia to announce the new $100 million competitive grants program. “In cooperation with the National Fish and Wildlife Foundation, this competitive grant program will fund innovative projects by States, local communities, tribes, non-profit organizations and other partners to rebuild, restore, and research these natural areas along the Atlantic Coast,” said Jewell. “By stabilizing marshes and beaches, restoring wetlands, and improving the resilience of coastal areas, we not only create opportunities for people to connect with nature and support jobs through increased outdoor recreation, but we can also provide an effective buffer that protects local communities from powerful storm surges and devastating floods when a storm like Sandy hits,” she said. The grant program will be administered by the National Fish and Wildlife Foundation, which began accepting proposals today. Jewell, U.S. Senator Tim Kaine, U.S. Representative Jim Moran, and local officials celebrated $25 million in federal funding for Dyke Marsh as part of a $162 million investment by Interior in 45 restoration and research projects to restore wetlands and beaches, rebuild shorelines and research the impacts and modeling mitigation of storm surges announced on October 25. To date, the Interior Department has invested $480 million in Hurricane Sandy response and recovery efforts. Also on the federal level, the Department of Housing and Urban Development, HUD, today allocated a combined $5 billion through a second round of recovery funds to five states and New York City to meet housing, economic development and infrastructure needs. New Jersey, New York, Connecticut, Rhode Island and Maryland will share in this funding. Grantees will be required to incorporate a risk assessment in their planning efforts to ensure long term resilience, the risk assessment must include climate change impacts. Last February, a week after President Obama signed into law the Disaster Relief Appropriations Act of 2013, HUD allocated $5.4 billion to assist communities located in the hardest hit areas. These investments are consistent with President Barack Obama’s Hurricane Sandy Rebuilding Task Force Strategy Report and the administration’s commitment set forth in the Climate Action Plan to build resilience to future storms by restoring natural features along shorelines. The Connecticut Department of Housing will develop an action plan to disburse the new funding, which will require approval from both the state legislature and HUD. In New York, HUD Secretary Shaun Donovan, New York Governor Andrew Cuomo and Metropolitan Transportation Authority Chairman and CEO Thomas Prendergast today toured Lower Manhattan to see some of the emerging technologies the MTA is considering as part of the agency’s hardening and resiliency efforts to protect the system from future storms. The MTA is designing solutions to fully prevent water incursion at the approximately 600 entry points in Lower Manhattan as well as vulnerable vent plants and openings in other flood prone areas. MTA New York City Transit is also analyzing all underground tube locations to ensure that critical points where water can enter the system are protected. Across the MTA, more than 70 projects are in design worth about $4.5 billion. 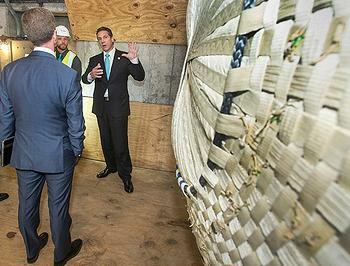 Five projects totaling $75 million are in procurement and 16 projects, worth $575 million, are already in construction. At MTA New York City Transit, design has begun for repairs to six subway tubes including work on signals, pump rooms, power and communications, tunnel lighting, and ducts. Over one million riders use these six tubes on the average weekday. New York City Transit also is building two new pump trains that will reduce the time needed to pump water out of the subway system. The MTA has also been researching and investigating existing flood mitigation and resiliency systems used worldwide for possible adaption in New York. New York Mayor Michael Bloomberg says 73 percent of short term milestones in the city’s resiliency plan released in June have been met or are near completion. The plan details 257 specific recommendations to harden infrastructure and protect neighborhoods. 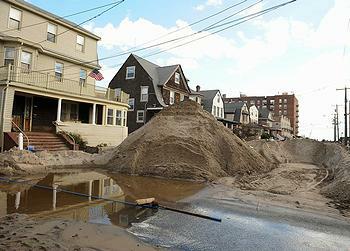 During Sandy, storm surge devastated the East and South shores of Staten Island, one of New York City’s five boroughs. Waves battered beaches and homes, leaving 23 percent of the red and yellow tagged buildings citywide on Staten Island shores. Nearly half of those tagged buildings were destroyed. The U.S. Army Corps of Engineers estimates that 1.5 million cubic yards of sand were lost in the Rockaways during Sandy. To date, 600,000 cubic yards have been replenished. By Memorial Day of 2013 all beaches were open for the summer, providing a vital economic driver for the Rockaways. By next May the the U.S. Army Corps of Engineers will add another 2.9 million cubic yards of sand to Rockaway beaches. Nearly 21,000 donors contributed more than $60 million to the Mayor’s Fund Advance New York City to help address unmet needs and fill gaps not funded by public dollars or programs. While recovery continues, new storms are brewing. AccuWeather reports though New Jersey’s Sandy-ravaged beaches reopened in time for the summer, the dunes that once barricaded the coastal towns and protected them from the ocean’s threats had been washed away by the storm. One year later, now that it is the season for severe storms that come from the Northeast, or nor’easters, storm-weary residents are wondering why the dunes have not been reconstructed to protect the coastline from Monmouth to Ocean and Cape May counties.